Kinshasa (Agenzia Fides) - "We do not agree with the results of the elections, but we want to collaborate with the authorities for the good of the country, asking them to found institutions on ethical values because only in this way they can be genuinely solid and democratic". 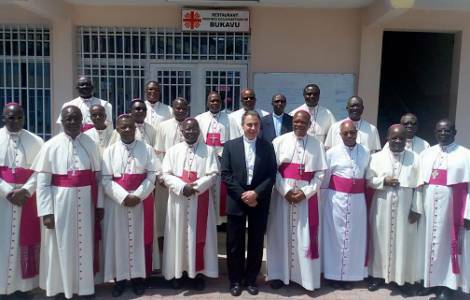 This is the meaning of the declaration issued at the end of the ordinary session of the Permanent Committee of CENCO, the Episcopal Conference of the Democratic Republic of Congo (DRC), entitled "The Truth will make you free". In the document, sent to Agenzia Fides, the position of CENCO is reiterated according to which "the results of the presidential elections published by the Independent Electoral Commission (CENI) do not correspond to the data collected by our electoral observation mission". According to the results proclaimed by CENI on January 10th, confirmed on January 19th by the Constitutional Court, Félix Tshisekedi was elected President in the elections held on December 30th. However, this result has been contested by the Episcopal Conference on the basis of data gathered from over 40,000 electoral observers deployed by the Church (see Fides, 11/1/2019). "Faced with this situation of denial of truth, most of the Congolese people experienced profound frustration. However, the Congolese people showed great political maturity, paving the way for peaceful alternation", said the statement. "In line with its prophetic mission, CENCO will never cease to accompany people in their fight for the rule of law", continue the Bishops who call politicians to respect "non-negotiable values": respect for the dignity of the person, truth, honesty, unity and national cohesion, justice and peace. "For this reason, CENCO will continue its civic and electoral education program for the population, as well as its commitment to promoting electoral observation missions so that the vote is credible".